Save your lungs! 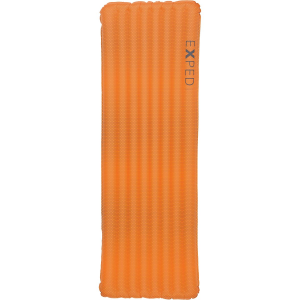 The Exped SynMat 7 Pump takes the strain out of sleeping soundly. As my user name might imply, I'm a big guy. Sleeping on the ground has not always been a comfortable experience for me. I'm also a side-sleeper, which can really be miserable if the space between Terra Firma and my shoulder is not taken up by adequate padding. 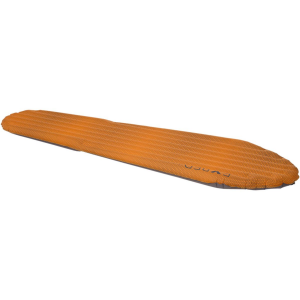 All manner of sleeping pads have come and gone, from the standard foam mat, to old-school Thermarests to Big Agnes Air Core pads. All of them work, of course, but all had sufficient drawbacks to warrant searching for better alternatives. The Thermarest pads that my wife and I used some 20 (!) years ago were prone to springing leaks. Our BA pads were super cozy, but were also a PIA to deflate and reinflate night after night, especially at higher altitudes. We needed something cozy, warm, and more user-friendly. While on a 3,500-mile motorcycle trip in 2003, my wife stopped in Seattle at the REI Mother Ship store. We love that they have a bunch of equipment out so that shoppers can play with it and see what it might be like in the real world. We found the Exped mats, messed around with them for about 5 minutes, and decided that those would solve our pad issues once and for all. We've been very happy ever since! The Exped SynMat 7 Pump features a built-in pump that allows the user to inflate the pad without the use of moisture filled lung power. This feature appealed to my wife, as she was getting kind of tired of head rushes whenever we camped. It also features a large deflation valve that cuts the packing time down by about two-thirds. Exped recommends unrolling the mat, opening the inflation valve, and letting it sit for about 30 minutes before pumping it up. It does make a difference in the time required to get the mat to the desired firmness. On average, I can inflate my pad in about 2-2.5 minutes if it's been sitting opened up, versus 3-4 minutes if I go at it right out of the stuff sack. Sleeping on the Exped is pure plush bliss! I use a Big Agnes Summit Park bag, and combination of the two has produced some of the best sleep I've ever had. Temperatures into the low-20's have not exposed any issues with insulation, as both of us have been warm and cozy. This will be our third season with these pads, and I've experienced no issues with mine. My wife's pad has developed a whistling/wheezing noise inside the baffles when she rolls over, and it's loud enough to have woken her up more than once. We plan to return the pad to REI for a new one. Neither pad has sprung any leaks, and cleaning them is as easy as wiping them down with a damp rag. One of the nicest features for me is the short amount of time necessary to deflate, roll, and pack the pads. With the Thermarests and the Big Agnes pads, this was a 10-minute or longer chore to do both when we broke camp. The large deflation valves on the Expeds cuts this time in half. In fact, I can have my pad down, rolled and stuffed in about a minute if I'm pushing it. Not bad! Overall, we are very pleased with these pads. Weight is not an issue for us, as most of our use with these is on motorcycle camping trips. Comfort is key, convenience is a big bonus, and we've got both with the Exped SynMat 7 Pump. I just received this inflatable pad in the mail today. I just received this inflatable pad in the mail today. It seems like a really nice pad. Appears to be put together really well. I bought the medium model, which is 72" long by 21" wide. It has an integrated pump, flat valve technology, pack sack, a small repair kit, and it is filled with 150 grams of Texpedloft Microfiber (synthetic insulation which is laminated to the upper and lower mat). It packs down slightly larger than a 1L Nalgene bottle and it weighs 30.3 oz (860 grams). The label indicates an R-value of 4.9 and a 1 degree F rating (-17 degree C). I took it out of the packaging and inflated it immediately. The pump worked great and it took less than 2 minutes. It is very comfy and it has a nonslip finish on it. I bought it from one of the online retailers on this website. I have had several occasions to use this product and it has performed very well. The coldest temp I have had it in so far was about the mid 30s. The built-in pump makes it easy to inflate and there is a valve which makes quick work of deflation. The synthetic insulation in the mat makes it usable to 1 degree F, at least that's what the manufacturer says. I have not felt any cold spots on the mat while sleeping on it. I have carried it two different ways in my pack. I stored it completely defalated in its sack inside of my pack. I have also carried it partially deflated to where I could roll it, like a cheap blue foam pad, and I tie it to the outside of my backpack in order to have additional space for extra food. Very comfortable, excellent insulation from cold ground, robust material — less likely to puncture. Packability. 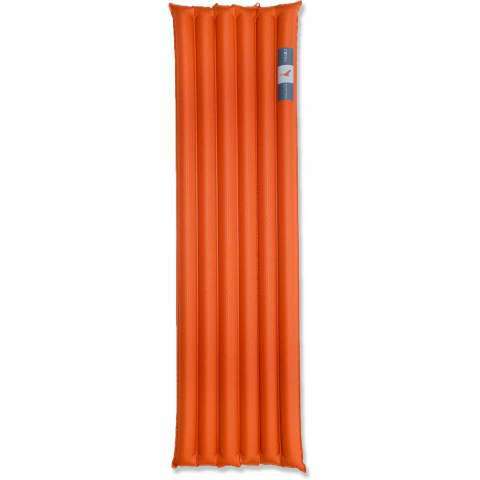 An excellent mat for 3-4 season camping, provides very good insulation on cold hard ground. Very comfortable — the trick is not to pump it up too hard. The built-in pump is an excellent feature. 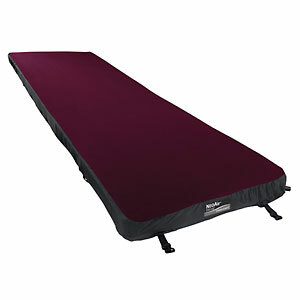 I also have the Synmat 7 UL, which is lighter, and without the built-in pump. Just as comfortable, but not as warm or robust. As with all these mats, you need to ensure the ground is free of sharp objects. The thickness of the mat is so much more comfortable than the 2.5cm self-inflaters. Have never slept better in the outdoors than I have since buying this product. Sleep better than at home! Synmat 7 inflates with about 110 compressions and deflates readily once bung removed. Rolls easily into bag the size of a loaf of bread for storage and transport. When placed side by side, two Synmats stay together rather than sliding apart, making sleeping with a partner very comfortable. The natural contours make it feel like you are in a double bed. The Synmat 7 mattress provides amazing support for the curve between one's waist and hips, which is significant for women in particular. When stomach sleeping, this mattress provides substantial support to the spine and pelvis. We have one regular (20 inch) Synmat and one wide (25 inch) and this arrangement works really well, making it feel like we are on a double bed. The wider mattress is definitely more comfortable for taller and wider campers. Finally, the Synmat ensures a warm snug sleep. Over the past year we have developed confidence in the construction of this mattress. Have cared for the mattress gently and have had no leaks or punctures. We've used our Synmat 7's on spring, summer and fall kayaking trips on the west coast and in the tropics for about 50 nights. Have camped on sand, stones, gravel, grass and the deck of a ferry (!) and it excels every time. While the initial layout for the Synmats seemed high, they have paid off in every way for us.